7 Beer Shops In 3 Days. The results from Saturday’s mission. The weather wasn’t quite as nice as I’d hoped it would be as I set off from Oval in south west London last Saturday, but there was beer to be bought so I soldiered on in the “getting a bit hot now, jumper of…nope, too cold, jumper back on” wind/sun/cloud. 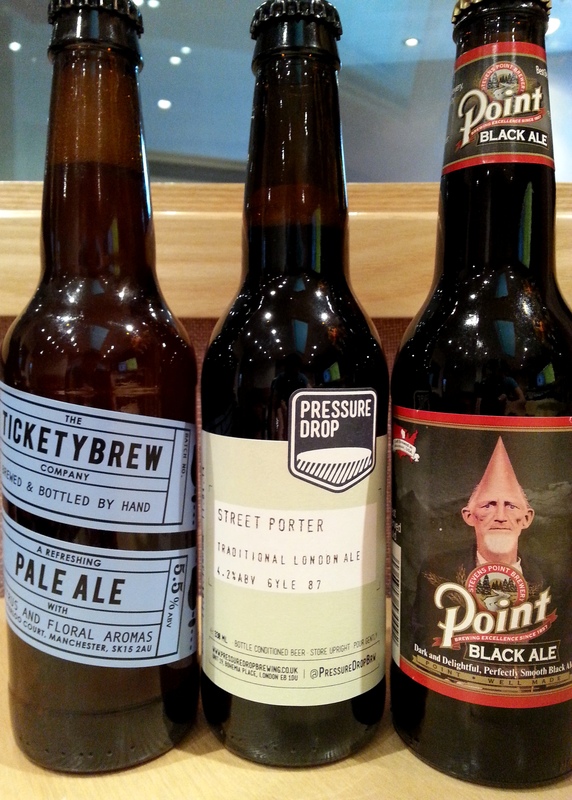 My journey took me to 3 beer shops, though Borough Market, up to Old Street and then on to Broadway Market in Hackney. You can see what I came away with in the picture. 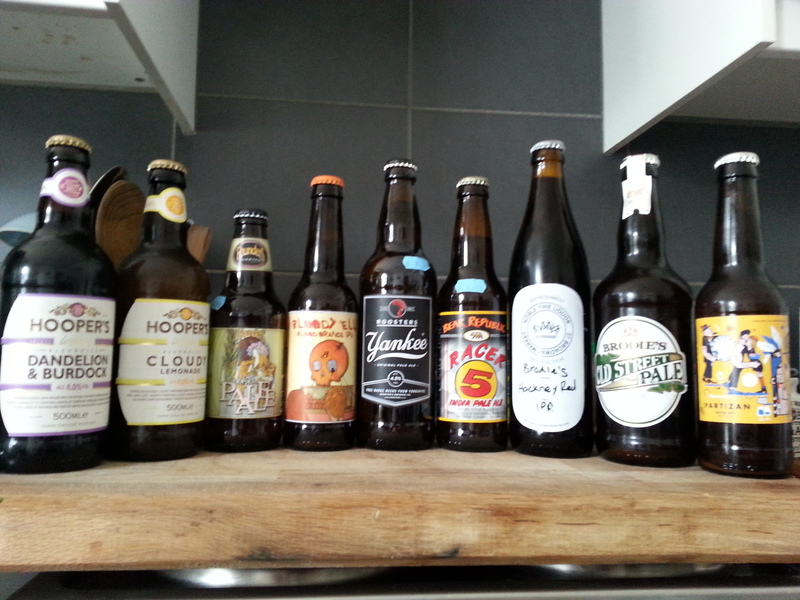 The first stop was Utobeer, with their wide and varied selection from around the world. I had to ration myself to one a couple from here as I still had a lot of walking to do. So, onward over London Bridge, past Bank and through the deserted City until I reached Old Street and popped into The City Beverage Company. 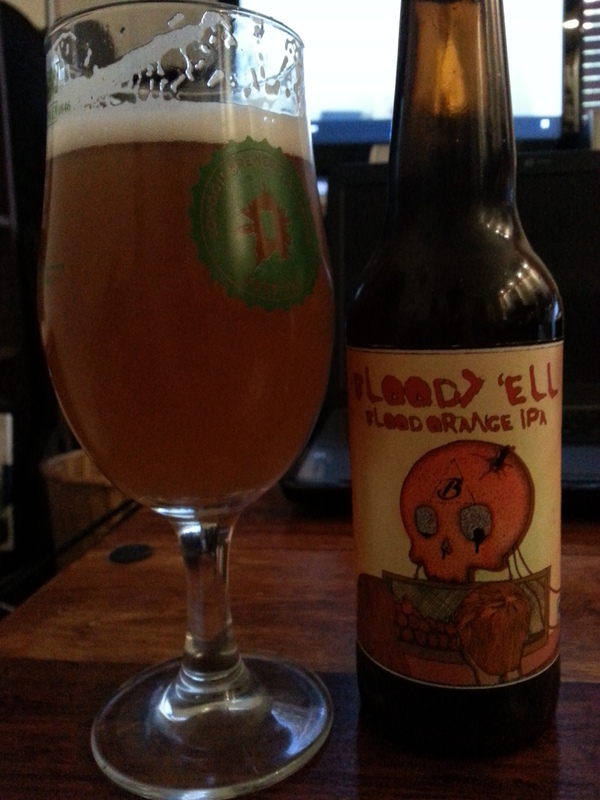 The only thing that jumped out at me there was Beavertown’s Bloody ‘Ell blood orange IPA, which was the penultimate bottle in the shop. The guy behind the counter quickly retrieved the last bottle for himself. I tried the beer that night and wow, it was good. A nice, balanced IPA with the usual tropical fruit and citrus flavours and bitter finish, but it also had a note of bittersweet orange juice running though it that made it delicious. As I ventured on towards Broadway Market, I passed a Nisa Local supermarket and swung in to have a look at their beers. There was nothing too inspiring there, but I did pick up a bottle of Hoopers alcholic Dandelion & Burdock, and a Cloudy Lemonade as I’m a big fan of those as soft drinks. Having tried them, however, they’re both a bit disappointing. The D&B was a bit fake and almost plastic-y tasting, and the lemonade was overly sweet. As I arrived in Broadway Market, I made my way through the hustle of bikes and moustaches to Noble Fine Liquor, a very well stocked wine and beer shop. It was my first visit, and since I’d tweeted about my pilgrimage the day before, I was greeted by Liam and given a glass of Buxton’s Moor Top to quench my thirst. It was light, citrussy and just what I needed. They stock lots of beers from Partizan, The Kernel, Brodie’s, Hackney Brewery, they have some Cantillion, but the standout is the 4 taps on the wall allowing you to buy takeaway cask ale and cider. Aside from the Moor top, they had 2 other beers, both from Brodie’s: Hackney Red IPA and the Apricot Sour. I tried both, and though the sour was good, I wasn’t sure about a whole pint of it (although Liam assured me it can be done) so I went with the Hackney Red IPA, which I really enjoyed. A big tropical flavour, but also with some autumnal, peppery notes in there too. And even after having the Hackney Red and the Moor Top, the flavour that was still with me was the Apricot sour. Damn it, should’ve bought some of that. So today’s Monday and after trying most of what I bought over the weekend, the standout, by a long way, is Beavertown’s Bloody ‘Ell. I need to get some more of it. So much so, I decided to take a walk on my lunch break at work and go to the beer shops in the area to see if I could find some. But alas, neither Royal Mile Whiskies, The People’s Supermarket, Sourced Market nor The Wine Pantry had any. But the weather was gorgeous, and I did pick up a couple of bottles from breweries I have yet to try, so not a wasted journey. And then when I got back to the office, I tweeted The Beer Boutique as I had seen Bloody ‘Ell in there a few weeks ago, but ehy too had sold out. Elusive stuff, it seems. But they did tell me that they would be getting more in and that they were doing a meet the brewer with Beavertown on the 20th June. I’ve got myself a ticket. Details here if you’re interested. So, I think I won’t be on any beer missions for a while now. My thirst has been quenched…for now.